From our base in Elciego at the Marques de Riscal, a Gehry designed hotel adjacent to the historic winery, we drove around this part of Rioja exploring the modern wineries that have changed both winemaking and landscape. I'm not a super fan of the old style Rioja wines, I much prefer the modern wines (reserva and gran reserva) which are aged in French oak and devoid of that heavy Rioja earthiness that perhaps others love, but I don't. My favorite wines and wineries are below in no specific order. Designed by IÑAKI ASPIAZU IZA and shown below in the first group of photos, this winery appears to be like the Glass House of wine making. Not really, of course as the wine operation is cut into the hillside with expansive views not only available from the pavilion, but also from the dining room and levels inside the hill. It's a remarkable place (more photos below) and the food in the dining room was outstanding (and, with the incredibly reasonable price of lunch and tour, it's a sin not to do it). The wine is quite good, modern Rioja, which is my personal preference over the traditional Riojan wines. A favorite was their white, fresh and crisp, but I also enjoyed the Belus which is from the Mazuela grape and the Reserva (Tempranillo). I brought home 3 bottles because it isn’t easily found in the US. A consistent statement for me across all the wine I brought home was: I was sad to see the bottom of the bottle. 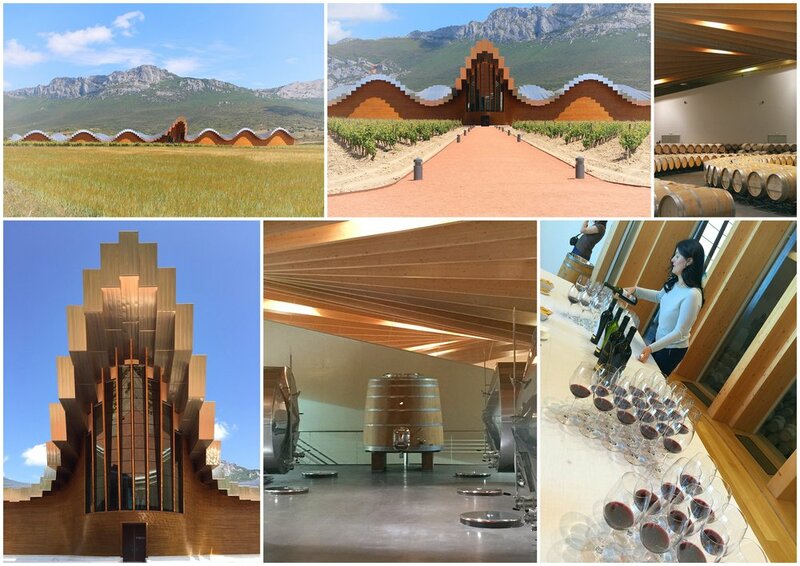 Architecturally, Ysios is probably the most famous of the wineries since its architect is Santiago Calatrava. It is beautifully designed and sits in its context just perfectly. The wines are delicious and modern. The tour was fun with a lively host guiding us through and reprimanding us from being too loud with our feet or voices: "the wine is ehsleeping." I brought back 3 bottles of this wine as well. One of them was exquisitely packaged and was a perfect gift for the holidays. Or, did I drink it? I may have gifted that to myself now that I think about it. Roda was my favorite wine of all, and I've luckily found it here in the states on occasion - most recently at - Rioja in Denver (of course!). We did not tour the winery due to timing difficulties but instead went to the tasting room in Haro which was superb. I brought home 3 bottles of Roda - Roda I, Reserva 2013, and Cirision. All delicious. The small tasting room is nicely designed and the person helping us was just great. We were not able to visit the actual winery as it was closed the day we were there. Vina Tondonia (R. Lopez Heredia) is a more traditional Rioja brand and wine, easily found in the US. If you like the classics, this is a good one and packaged very nicely for the higher end bottles. Adjacent to the winery in Haro’s central area is a tasting room designed by late architect, Zaha Hadid. It’s a small and clever little structure - a twist on a bottle - and fun to visit. I wouldn’t put this at the top of her famous works, but it’s a nice intimate little building designed with a bit of whimsy and including some of her typical motifs. The actual winery tour was worth it. Very old world winery (one of, if not the, oldest in the region) with interesting stops including the shop where they used to make the casks and a walk out back to see the river.